Support Creek Hockey All Season By Dining at BW-3s! 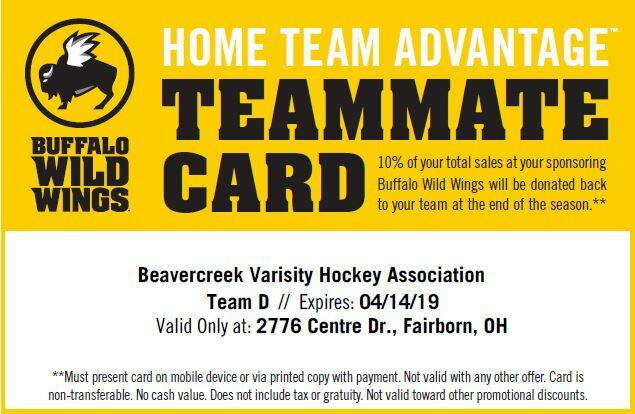 By dining at the Buffalo Wild Wings by the Fairfield Commons Mall you will support Beavercreek High School Varsity Hockey this entire season (through 4/14/19)! Present the coupon below every time you dine at BW-3s and 10% of your total bill will be donated to Creek Hockey. We thank you in advance for your support of BHS Varsity Hockey!! Registration Open For Beavercreek Varsity Hockey Friends & Family 2018 Golf Scramble!